Recording and releasing songs since 1964, this is where David Bowie’s pierces through the pop world’s stratosphere in a breakthrough moment that would ultimately see him take his place among the stars. Netting him a Top 5 hit, Bowie’s bleak commentary was inspired by Stanley Kubrick’s visionary epic 2001: A Space Odyssey was first released a week before Neil Armstrong set foot on the Moon. Major Tom himself orbits around Rick Wakeman’s soaring Mellotron in an arrangement that floats between the mundane details and the allure of the infinite. A giant leap in every sense of the phrase. It’s astonishing to think that in 1975 Bowie had been making smoochy soul with Young Americans and crooning Wild Is The Wind on Station To Station in 1976. Nobody could have predicted anything as radical as side two of Low. The funereal pace of Brian Eno’s Mellotron-heavy instrumental indicated Bowie was by now marching to the beat of an entirely different drum to the one his record company would have preferred. Bowie’s vocal channels something akin to the chilling harmonies generated by Voix Bulgares and a call to prayer. Many would indeed heed the call. 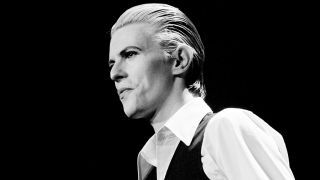 Whether you see it as a simple love song or as a cold war allegory, Heroes exemplifies Bowie’s uncanny ability to soak up the sounds around him and convert them into something entirely original. With chugging beats reminiscent of a slo-mo NEU! frosted with Eno’s EMS synth, Robert Fripp’s guitar, famously done in three scorching passes straight off the plane, provides an uplifting epiphany. King Crimson played Heroes during their 2000 and 2001 tours - making it the only song by another artist to be performed by Crimson on a regular basis. Gender-bending and genre blending was always part of Bowie’s stock in trade, determinedly pushing at convention and conventional thinking. Coached by Brian Eno’s Oblique Strategies cards, many of the musicians swapped roles during the making of Lodger, with drummer Dennis Davis thumping the bass while Carlos Alomar forsakes the frets for the skins. However, there’s no mistaking Adrian Belew’s brilliantly manic string-bending strokes and Hawkwind’s Simon House’s FX-saturated violin. In which Robert Fripp, then out on the road with his pointilistic pop combo, The League Of Gentlemen, steps out of the van on his way back from a gig in Leeds just long enough to spray some hot licks over a brace of tracks that included Top 5 hit Fashion, Scary Monsters (And Super Creeps), Teenage Wildlife and this little toe-tapper. Bowie’s agitated bellow and Fripp’s belligerent blocks of obstinate chords gives listeners a clue as to what happens when an unstoppable force meets an immovable object. Brian Eno wrote regarding his friend’s passing, “About a year ago we started talking about Outside - the last album we worked on together. We both liked that album a lot and felt that it had fallen through the cracks.” Pilloried by some at the time for its perceived self-indulgence, Outside will be now be re-evaluated and be found to be one of his very best. The brutally stunted sonic landscape, Mike Garson’s turbulent sparks of piano and Reeves Gabrel’s blow-torch guitar cast a shaky light upon a dark mysterious space that’s both intriguing and unsettling.